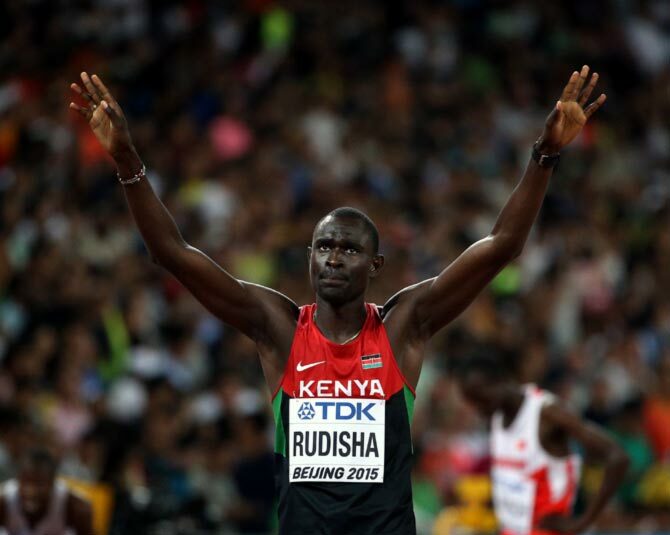 Kenya's Olympic champion David Rudisha put three difficult years behind him and trusted his finishing pace to regain the world 800 metres title at the Bird's Nest in Beijing, on Tuesday. Still not back at his best after the knee injury that cost him his chance to defend the world title in 2013, the 26-year-old kicked for home at the end of the back straight and held on to win gold in one minute 45.84 seconds. The strain of the last 50 metres was clear on his face as he held off Pole Adam Kszczot and there were no huge smiles from the quietly-spoken world record holder after crossing the line, just a single finger raised to the sky in celebration. "This is really special for me," he told reporters. "Despite the fact that I was coming from a bad injury that almost pushed me out of my career ... to be back here and to prove to the world that I can win the world championships it means a lot." After being exposed by faster finishers a few times since his return from the injury, Rudisha raced out to the front and tried to control the pace. "The race today was more tactical, I was not going for anything fast," he said. "I know for the last month I have been working on my speed and I was very confident coming here and I knew that if the pace is slow I could win the championships." In the absence of defending champion Mohammed Aman of Ethiopia and London Olympic silver medallist Nijel Amos, who both failed to reach the final, Kszczot won silver in 1.46.08 courtesy of his strong finish. "It is not gold but I can't be unhappy with this awesome silver," said the Pole. "It is hard to fight against the world record holder but I think he was possible to beat." Bosnia and Herzegovina's Amel Tuka, who has slashed more than three seconds off his personal best this year, finished third in 1.46.30 to win a first world championship medal for his country. 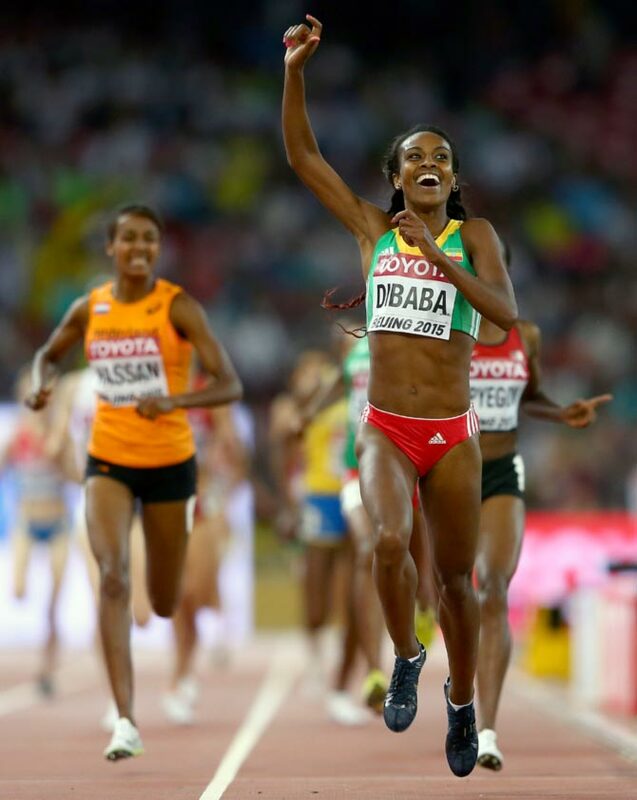 Ethiopian Genzebe Dibaba stormed to a dominant victory in the 1,500 metres to claim her maiden major global title outdoors. The 24-year-old world record holder, indoor world champion in 2012, tired of a tactical race and hit the front with two laps to go, outpacing the field over the final 800 metres to win in four minutes 08.09 seconds. Dibaba, sister of three-times Olympic champion Tirunesh and cousin of twice Olympic champion Derartu Tulu, was followed across the line by Kenya's Faith Kipyegon, who won silver in 4.08.96. Sifan Hassan took bronze for the Netherlands in 4.09.34. Kenyan policeman Nicholas Bett charged down the home straight to win the world championship 400 metres hurdles final on Tuesday. Drawn in the outside lane nine, Bett had to run the race blind, unable to see his rivals until the final stages. He was placed fifth coming off the last bend, but heovertook Russia's Denis Kudryavtsev over the final flight of barriers and stormed home in 47.79 seconds. Kudryavtsev held on for the silver medal in a Russian record 48.05 with Jeffery Gibson of the Bahamas taking bronze in48.17. The American challenge from former champion Kerron Clementand pre-race favourite Michael Tinsley disintegrated under the pressure. Clement, the 2007 and 2009 world champion, finished fourth in 48.18 while Tinsley jogged home last after an error-strewn lap. 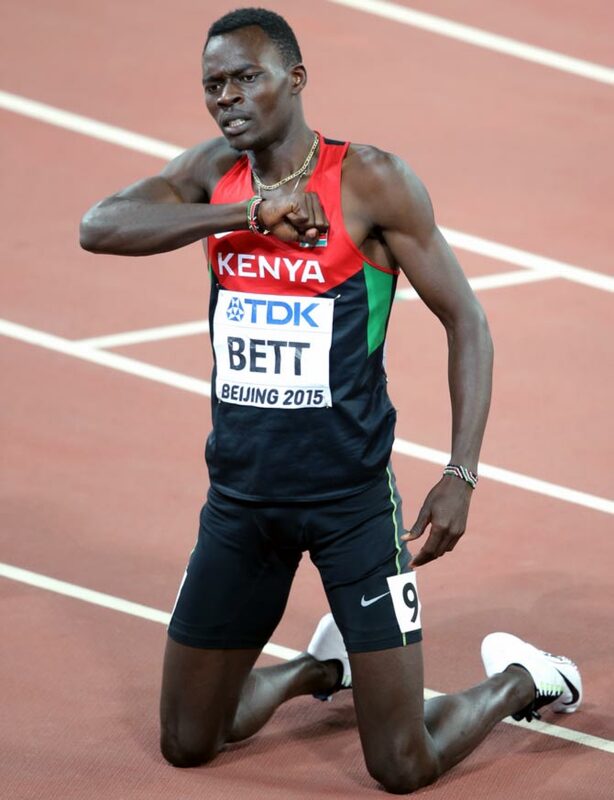 Bett, became the first African to win the 400m hurdles world title since Zambian Samuel Matete in Tokyo in 1991, set a Kenyan record and ran half a second faster than the lifetime best he established at altitude in Nairobi this month. "In the semi-final I made a mistake with the steps between hurdles, so in this final I was able to correct it," the 23-year=old Bett told reporters. "It is wonderful to be the world champion. I achieved a PB and NR this year so I say thanks to God." Kudryavtsev, also 23, is coached by the former 800m world champion Yuri Borzakovski. "I started easy then I tried to do my job. I didn't want to make any technical mistakes, my technique is one of my best qualities. Getting into the final with the best time pushed me." 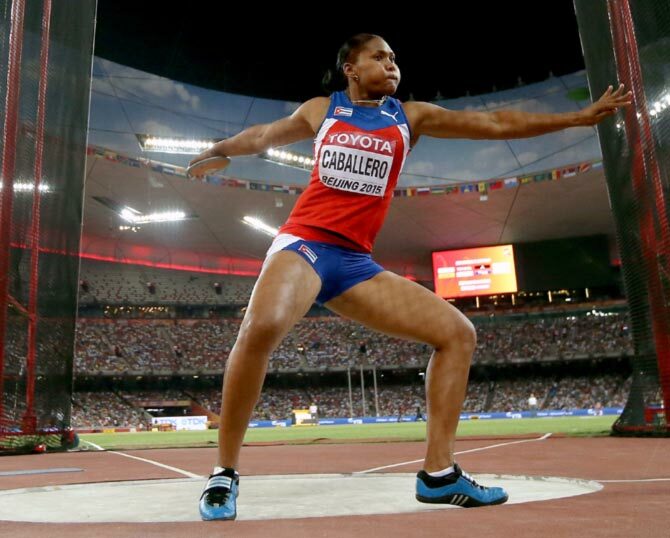 Cuba's Denia Caballero landed a shock win in the world championship discus on Tuesday, her first round effort of 69.28 metres beating all her rivals including defending champion Sandra Perkovic of Croatia. Olympic champion Perkovic salvaged the silver medal with a late effort of 67.39, having gone into the final round facing the prospect of going home empty-handed after a mediocre series of throws that contained three fouls. The bronze went to Germany's Nadine Mueller, with her best of 65.53 also coming in the first round. Caballero is small by discus standards, at 5-foot-8 (1.75 metres), and she was dwarfed by her fellow medal winners as they lined-up for the mandatory post-event photos. It has been a breakthrough year for the Cuban who also passed the 70-metre barrier for the first time in June. "The first throw was very important for me. I wanted to put Perkovic under pressure," Cabellero told reporters. It was a plan that worked as the triple European champion fouled with her first, third and fifth-round throws. Perkovic might have been eliminated altogether had her 65.35 second-round effort gone a metre to the right and out of the permitted sector. "It's been an amazing day," said the 25-year-old Caballero whose previous best performance was eighth place at the 2013world championships. "I've been praying for this medal. I wanted any medal but gold is the best."